This was my 19 year old godson Mario McGee. A wonderful person, a hard worker, family oriented individual and an up and coming musician and songwriter. May God forever bless his memory. 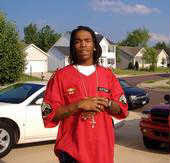 Unfortunately, his death was the first murder of 2009 in the Peoria community and will hopefully be the last. In this post, I will share with you the contents of an email sent to as many area pastors as I could find in efforts to ask them to help us address the community terrorist group responsible for this killing. It is reported that gang warefare has existed in Peoria for quite some time. Particular groups have been responsible for multiple beatings, shootings and now a home invasion murder has been added to their list of misdeeds. It is time for the Pastoral community to rise once again to combat this enemy and transform the streets of our community and allow our children to live in safety. We have finished another 40 Day Prayer Vigil, now, it is time to act. Thank the Lord for each of you and the ongoing prayers for the safety and condition of Peoria. Ephes. 6:11 ~ "For we wrestle not against flesh and blood, but against principalities, against powers, against the rulers of the darkness of this world, against spiritual wickedness in high places." For those of you who don't know or were not aware, I was the godparent of now deceased Mario McGee. Slightly over 19 years ago I held that young man in my hands feeding him a bottle and changing his pamper. It does my heart no good to have to bury him this week as he should have been a pallbearer or minister at my funeral. Since our march and community rally of June 2006, that led to the areas first Gun Exchange, that led to the areas first 40 Days Of Prayer effort under Pastor Preston, That also included multiple other prayer efforts such as the Transformation Celebrations directed by Pastor Eckhardt and others, this area has not seen such a heinous crime or murder perpetuated upon a family. Mario begged that his mother's life was spared and God honored that prayer and although she was intended to be killed she is alive and dealing with the results today. 2 Cor. 10:3-4~ "3-For though we walk in the flesh, we do not war after the flesh: 4-(For the weapons of our warfare are not carnal, but mighty through God to the pulling down of strong holds;)"
It is my prayer that you will join me at a community pastoral meeting to address this urgent situation at which I will unveil information that is essential in assisting with our understanding of this enemy that we face. I also plan to unveil a community strategy that will involve you and your church in a proactive method of attack against this terrorist group. I am convinced that our inaction is fuel to the flames of the community terrorists who have staked claim to our schools and our streets. It must end and that end must begin with us and our churches. I do not believe that we can expect a government bailout to assist us with this one. Please pass this urgent request on to associates and other pastors who may also be interested in taking strong action against this (these) community terrorist group(s). Thank you and God bless you greatly. My comment has to do with how can it be that many ministers and preacher here in Peoria Illinois know about Pastor Jackie Adams and his continual church issues yet they are silent.This man has kicked people out of a house that does not belong to him if he is who and what he say he is.Why are there at least three ministers that know of Jackie Adams hidden affair with one of his now ex-members church wife whom he refuse to counsel the then couple,but now suddenly he is dating this woman behind the congregations back.Yes there are even court documented papers if you don't believe Christian folk stop acting like yall don't know whats going on even kids know about this wicked and evil affair. I tell you if it wasn't evil then why is everyone sneaking around after church.Tell me how many of you have been to Pastor Jackie house after church or even after Dark, not many.Like I said there are some really bad things going on at Faith ministry just ask Jackie Adams. I would like the community to know that Pastor Jackie Adams is a lie, an adulterer, a con man. He has been misleading his congregation for a while. He has been having an affair with a married man wife since 2005. He ate dinner at this man house on a few occasions. Then the man and his wife Roxie at that time were having trouble in their marriage. The man asked Jackie Adams if he would counsel him an his wife. Jackie said no because he didn't do that. Well come to find out Jackie was having an affair with this man wife and is still to this day going off on weekend with this woman. This is the truth there are other ministers who know about this Mr.Jackson and Mr Davis and many others who refuse to speak to this hypocrite concerning his behavior.I tell you no lie this is the truth as told to me.